I recently had the pleasure of presenting a paper at a conference entitled “Legacies of the Gulag and the Memory of Stalinism” at the NIOD Institute for War, Holocaust and Genocide Studies in Amsterdam. 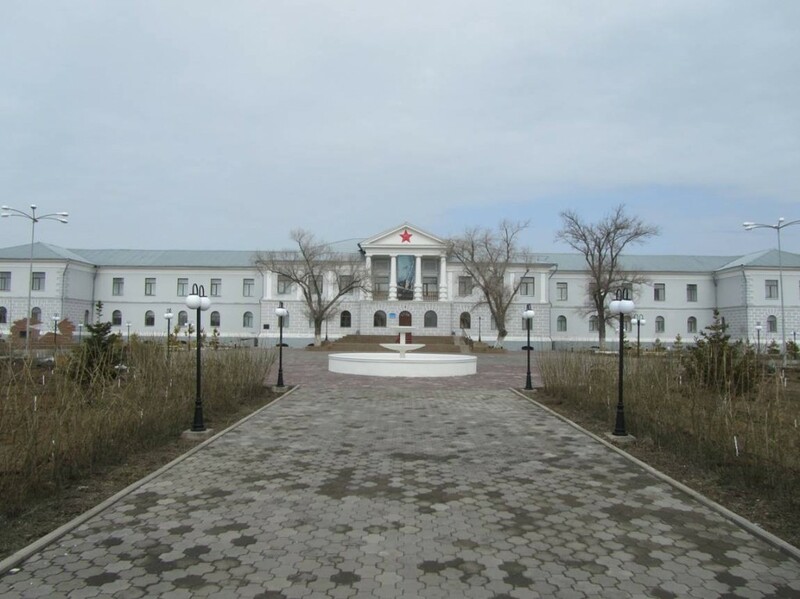 My paper focused on public memory of the Gulag in post-Soviet Kazakhstan. The Kazakhstani experience differs significantly from that in Russia, a topic discussed at the conference by Arsenii Roginskii, Nanci Adler, Alexander Etkind, Nikita Petrov, Andrei Sorokin, and others. While the paper is perhaps too long for this forum, I wanted to share the portion of it discussing the “Night in Karlag,” a fascinating (and disturbing) recent moment in Kazakhstani public memory of the Gulag. The event raises interesting questions about the appropriateness of the experiential museum and historical reenactment for the portrayal of atrocity. The tiny village of Dolinka, Kazakhstan, some 45 kilometers southwest of the city of Karaganda, is dotted by the typical ramshackle single-story dwellings found in small rural settlements all over the former Soviet Union. 1 Until just over a half century ago, Dolinka served as the capital of the infamous Karaganda Corrective Labor Camp (Karlag), an enormous camp complex that stretched hundreds of kilometers through the Kazakh steppe and held hundreds of thousands of prisoners as one of the largest and longest-lasting outposts of Stalin’s notorious Gulag (and was the primary subject of my first book).2 Driving through the settlement, you pass several blocks of the single-story hovels when a massive, city block-long, two-story, neo-classical building appears rather jarringly out of the steppe. 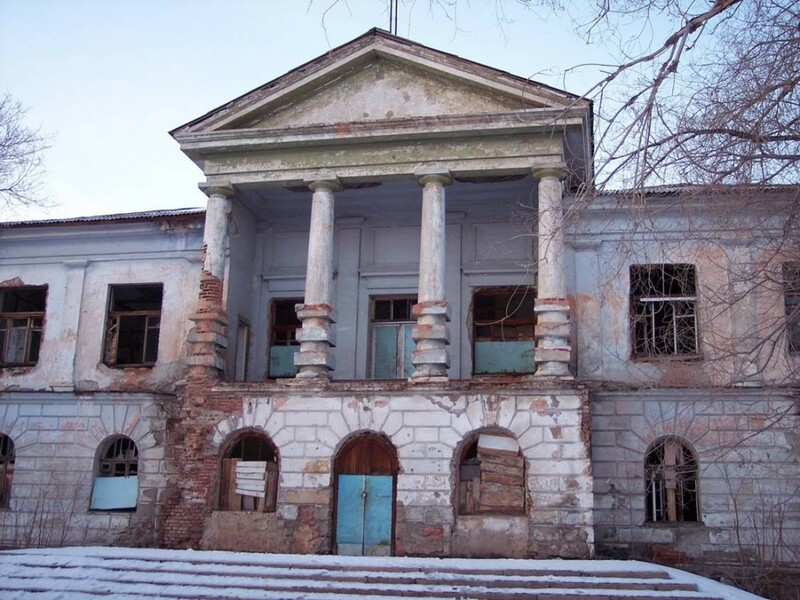 Some eighty years ago, prisoners constructed this building to serve as headquarters for the Karlag administration. This massive structure, which only housed the central Karlag administration and was supplemented by supervisory and armed guard staff in the camp’s many subdivisions spread about the northern Kazakh steppe, attests to the massive numbers of prisoners who suffered in this labor camp outpost. Abandoned and boarded up until recently, the building now gleams after a pricy rehabilitation that transformed it into the Museum of Memory of the Victims of Repression in the Dolinka Settlement (hereafter the Karlag Museum). Officially founded in 2001, but only opened in May 2011, the Karlag Museum is probably the largest Gulag-related museum in the former Soviet Union. The Karlag Museum occupies all three floors (two above ground plus the basement) of the enormous Dolinka headquarters with no fewer than thirty halls and exhibitions. The museum is a combination of traditional museum practice with the experiential museum so much in vogue today. 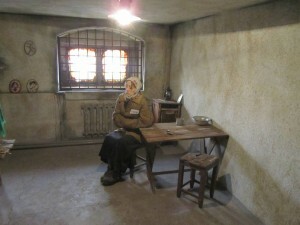 The first floor features a series of exhibit rooms devoted to topics like the early 1930s famine in Kazakhstan, the political repression of the Kazakh intelligentsia, the foundation of Karlag, the economic activity of Karlag, repressed artists, women and children in Karlag, deportations of peoples to Kazakhstan, repressions of the post-Stalin years, and post-Soviet Kazakhstan as an independent state. These exhibit halls, in what I would call the traditional part of the Karlag Museum, are mostly dominated by a series of glass display cases holding historical photographs, artifacts, and text blocks explaining the history of Soviet repression in general and the Karlag labor camp in particular. Descending to the basement level, the museum takes a turn toward the experiential. Of course, basements have long held a morbid place in tales of Soviet citizen encounters with the secret police. 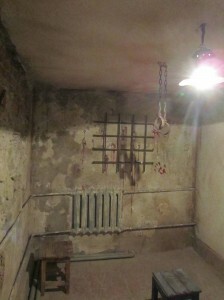 Basements, like that of the notorious Lubianka in Moscow, were places of imprisonment, torture, and all too often execution. 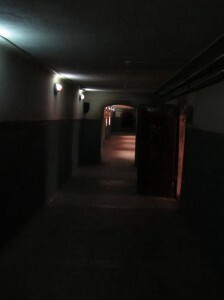 The Karlag Museum pulls out all the stops to capitalize on that mental imagery of the NKVD basement, even though the tour guides admit that they have no particular information that individuals were ever held, interrogated, or tortured in the basement of the Dolinka headquarters. The dark, dank corridor of the basement level, barely renovated with concrete floors, contrasts sharply with the first floor corridor’s inviting, red runner carpet stretching the length of the building and abundant natural and artificial light. Entering the basement is intended to evoke a feeling in the visitor of entering a different world, a different time. Here in the basements the walls are bare, broken up only by a series of doors on one side of the corridor, and no text blocks guide visitors along the corridor, as they are invited to enter the unknown—to feel rather than think the history they are confronting. Enter through any one of the doors along the corridor, and you enter an imagined life world of the prisoner. Mannequin prisoners, guards, bureaucrats, and interrogators occupy a punishment cell, male and female barracks, a torture chamber, an infirmary, a morgue, an office for photographing and fingerprinting prisoners, and even a scientific laboratory. Genuine period artifacts from bowls and spoons to prisoner mugshots are intermingled with the mannequins and other reconstructions like barrack bunks to draw the visitor into a world simultaneously imaginary and real. Often it is impossible to tell the authentic artifact from the reconstruction. Perhaps the basement room most readily evoking a sense that the visitor has time-traveled to an earlier era is the only one without a mannequin. A single bare bulb illuminates sparse furnishings. A water bucket and two small stools are the room’s only furniture. One stool sits in the far corner, the other directly in the room’s center. Lifting your gaze from the central stool, you notice a pair of rusting manacles hangs from the ceiling. Other bits of steel and chain hang from the walls. A meter-long stick leans against a side wall, just beyond the water bucket. One end of the stick has been splattered with a red paint in a shade so vibrant it suggests not 80 year old blood stains but evidence of more recent prisoner beatings. Every wall is splattered with this “blood” in a combination of the stick’s vibrant shade and a much darker hue, indicating both recent torture activity and a long history of brutal prisoner beatings. A “bloody” handprint on the far wall evokes a prisoner driven to madness trying to somehow pass through the walls to escape the pain. Even the water bucket has “blood” running down its sides. The only hope for respite comes through a doorway to the morgue, where a “blood”- stained stretcher marks what seems to be the only possible escape from the building—death. On the one hand, the event was a “success.” Obtaining substantial visitorship is a significant challenge for a museum located in such a remote, hard-to-reach location. Furthermore, the “Night in Karlag” was covered by at least four different Kazakhstani and one international television stations. 5 Yet my gut reaction is that the absurdity and unseemliness of the event outweighs any addition of emotional value for the visitor. Notably, the torture chamber, the one basement room without even a mannequin in its regular setup, seems significantly less powerful with an actor hanging from the manacles, while a “guard” almost comically repeatedly demands of the prisoner, “Don’t sleep.” (See the photos from RFE/RL.) The visitor of the empty torture chamber can almost imagine that the room is actively used, but the patently obvious unreality of the actors breaks the spell. I do not pretend to have a simple answer to these complex questions. I do want to note, however, that intellectually or viscerally, through language and image or in a more immersive and experiential fashion, remembering the past does not necessarily result in the reconciliation or healing we might seek.9 Does visceral traumatization connect the viewer with the traumas of the past, or does it merely preserve and transmit that trauma into the present? The experiential museum may, in the end, simply be too problematic for use in portraying the history of atrocity. This entry was posted in Gulag, Kazakhstan, Nostalgia and Memory, Soviet Era 1917-1991. Bookmark the permalink.